We took a short vacation this past weekend. 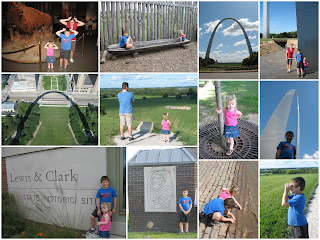 We followed the old Route 66 from Chicago to St. Louis. We tried to see as many of the historic sites as we could. It was fun to pass through all of the little towns and stop at the museums and restored gas stations. In the video you'll see the Rich & Creamy ice cream stand (where soft serve was invented), 1933 Texaco Station (the longest operating gas station along Route 66), the Gemini Giant (27 foot tall mascot of the Launching Pad Drive-In), 1932 Standard Oil Station, Cozy Dog Drive-In (where the corn dog was invented, originally called the "crusty cur"), the Ariston Cafe (built in 1935 and kind of smelled like it, too, but the deserts were delicious) and the 1926 Soulsby's Service Station (one of the oldest on Route 66). We spent a night in Springfield and stayed right down town. All of the sites were within walking distance of the hotel. We toured Lincoln's law office, the old capitol building, the Lincoln Presidential Museum and Lincoln's home. 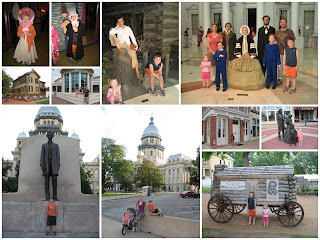 The sites were fun and educational, especially since this year is the bicentennial of his birth. We learned a lot about who he was as a person, not just the myths and legends we're all familiar with. Lincoln built his career there, left for the White House from there and is buried there. It was well worth the time we spent to learn more about this American icon. We also spent one night in St. Louis. We went up in the arch and the view was magnificent. We also visited Camp River Dubois, the departure site of the Lewis and Clark expedition at the confluence of the Mississippi, Missouri and Dubois rivers. Jake loved the 55-foot full-scale replica of the expedition's keel boat. Then we headed over to Cahokia Mounds State Park which is considered the largest historic Native American settlement north of Mexico. We finally rolled back into town late at night and worn out from the trip but having a greater appreciation of our not so distant past.